Zara is our beautiful brindle girl from the breeding of CH. O'Ryan's Promise of Avalon and CH. Takara's Cousin Cogs. She has the flashy color of her sire COGS and the beautiful movement of her dam, PROMISE. 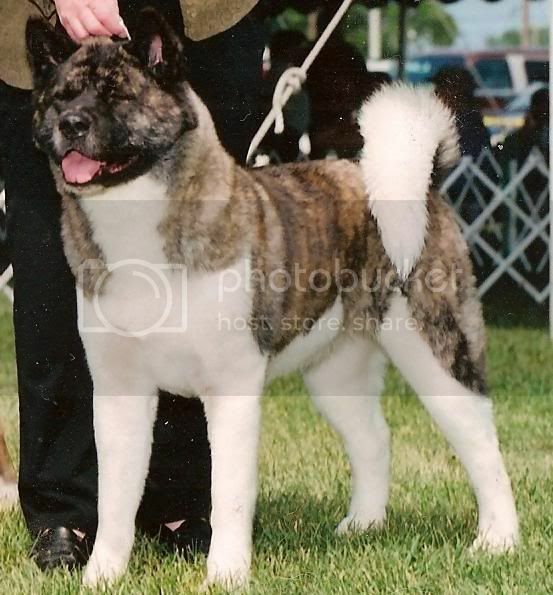 in the Stud dog class at the 2007 Akita Club of America National Specialty, where they received 2nd place! Zara is currently MAJOR POINTED and expecting a litter in August 2010 out of Ch Timbersky's Outdoor Adventure, please see our BREEDINGS page.